The public realizes that it isn't worthwhile to sit around all day, in front of a screen for hours. More and more, people want to get outside to green spaces with their families. StoneSet is great for parks and green spaces! It's easy to get playful and creative with StoneSet. Fun patterns and colourful designs can transform any open space into a place that kids want to play. StoneSet can also create beautiful, natural-looking pathways and spaces that are smooth and fully bound. Safety is always the foremost concern when it comes to playgrounds and children. StoneSet is slip resistant and trip hazard free. It is ideal for bicycle lanes, footpaths, park paths open, spaces and playgrounds. Water drains fast on StoneSet following rain, leading to fewer slips and falls to toddlers and children, as well as adults. The manufacture of concrete is one of the largest contributors to CO2 emissions in the world today. StoneSet is made from locally reclaimed and recycled materials. The coloured recycled glass provides a virtual rainbow of colours to design with in addition to being fully sustainable. StoneSet is proud to create awareness to environmental issues and help to educate future generations. StoneSet is porous, allowing water to run right through and return to the water table, providing water and nutrients to trees, shrubs and other greenery. It can also soften sound vibration, making it perfect for enclosed playground areas. 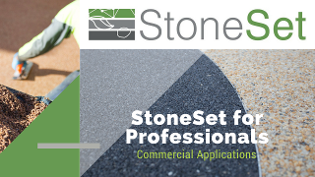 StoneSet can be installed on existing concrete. Even if the concrete is still usable but is cracked and unappealing, StoneSet may be used to breathe life back into the playground or green space. This further lessens waste and the need to fill up landfills. As a bonus, StoneSet is easy to clean and maintain, with a design life of 25 years. Families with children as well as anyone who loves the outdoors will appreciate the design and careful planning that went into StoneSet.